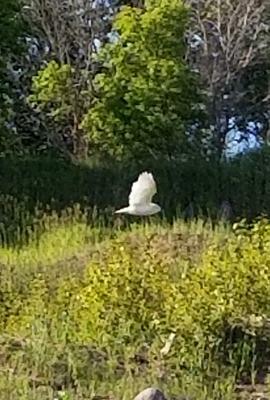 While 4 wheeling behind our house in a sand quarry we came across a Snowy Owl. This was on June 9th 2018. It was beautiful and sitting on a pile of rocks. When it took flight I managed to get a picture of it. It is pure white and never flew far, only to another high point in the pit. I was so happy to have seen this awesome bird and I hope it stays here for the summer. Join in and write your own page! It's easy to do. How? Simply click here to return to Snowy Owls.